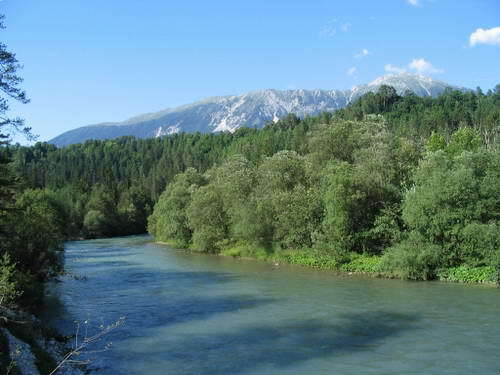 Just above its confluence with the river Sava Bohinjka, the river Sava Dolinka had excavated a valley in a moraine of Bohinj glacier, closed from both sides. Still today there is neither a highway nor a railway leading through it. A vigorous and torrential river had separated a slightly undulated landscape of Bled from a flat land beneath the Stol mountain. A separation is just an appearance, as the river created and deepened, running through a lake sediment and glacier alluvium, the new relationships. Things which are elsewhere hidden under the surface, here become visible again. In a long period of time and space the river created a valley, which restores the echo of the river's name: Sava Dolinka. A dull buzz from the valley leads to the river and guides deeper beyond the traps of civilization into the earthly layers to become one with the nature itself. Bled is realy a kind of nook: on the north it is closed by Mežakla and Hom hills, on the west there is the natural obstacle of the Pokljuka plateau and the mountain of Triglav and on the south there is Jelovica plateau. A chain of high mountains and plateaus is broken on east, where the valley mornings the sun. The valley of Sava Dolinka is a gap between inhale and exhale of days and nights, which renders us to see space in all its freedom, simplicity and variety. Right here, between Vrba and Bled is a place, which represnets the essence of our's and our poet Prešeren's likeness of paradise. Let it take its course! In the middle of the fields, between settlements Dobe, Gmajna, and Zasip, behind the dense forest edge above Dobravci, a special world, a real oasis of untouched nature is opened to the visitor. From the steep road following tightly the slope, descending toward the stream of buzzy river, now and than a contour of tall red pine trees could be seen from the bottom of the valley, covered by the bright green of beech, white beech and hazel trees. This special atmosphere is intensified by the play of sun rays which now and than succeed to reach ground through the dense vegetation. Various birds sing their songs, among them black birds, titmouses, common chiffchaffs and song thrushes, the best singers. With every step we enter deeper in the valley and its earthy history. Agglomerates of sand and stones of different forms are seen emerging from the ground vegetation like the remnants of ancient ruins which were brought here by the glacial and uncovered by the river itself. It can still be seen the creativness of both, the power of glacier and the force of water. The first one grinds and transports, the last one polishes and carries further. But it remains what has been created here. From the road at the bottom of the valley the view is opened of the peak of the mountain Stol with the Golica ridge. An attentive visitor is able to notice a trace of an old river-bed along the road. On the other side, if he is curious enough, he could find out that at a place where the pine trees are the most abundant, a trace of an island still exist as an evidence that the river had change its course. Water from the springs emerging from the slopes of the valley is still filling the old river-bed and supply various wetlands. This spring-water finding a way through the alluvium of an ancient lake is saturated with limestone depositing it at a location as a travertine. Within the porous stone there is hundreads of life forms creating cups and artificial passages gethering in a picturesque, some ten meter long golden – yellowish cascades. A vivid rock soaring before our eyes is fragile like a lace therefore just one false step can destroy that masterpiece of centuries. Here we are sharing an experience of the vulnerability of life compared with the fragile rock which is carrying only a bit of it. These are the last travertine cascades preserved in the region of Gorenjska. The area with the name B’rje which means wetland, hides-some exceptional and rare plants and is therefore protected as a natural monument. A stand of Saw-grass, a vulnerable plant is thieving at the foot of a slope while a tiny Fen orchid finds an unstable moisty substrate as an ideal growing place. On worm days, when the sun hits the slopes, the valley smells on the red pine trees. An association of red pine trees and grasses (Brachypodio-Pinetum) is rare, extending mostly along the river Sava Dolinka being the most abundant and beautiful right here. The land used as a pasture in old times, has been gradually overgrown by pine trees, willows, elms, ash trees, beeches, spruces, reaching nowadays a high biotic and landscape diversity. This should be a forest of a special value, with ecological and social function being more important than economic one, taking also in a consideration its position of a green zone of Bled. The water sources and marshy sites which remain opened, not being overgrown by the forest are important sites for the migrating and overwintering birds as well as important ecological niches for wildlife. Woods, shrubbs, meadows, overgrown pastures, river banks, river and of course riverside wetlants are abundant mosaic of habitats. The EU legislation pays special attention for them and ranks them among habitat types with a priority of conservation. In such special environment rare flower and animal species are living. A tiny yellow blooming Fen orchid (Liparis loeselii) being on the Red list as an endengered species, has on the river banks of Sava Dolinka two of a few habitats in Slovenia. 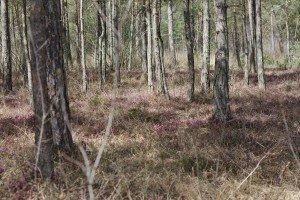 The Convention for protecting an European vegetation and wildlife suscribed also by Slovenija, ranks it among severe conservated species. Just a few flowers can be noticed on a small area of some square metres. The Saw grass (Cladium mariscus), a Cyperaceae with sharp cutting leafs had colonized an old river-bed. The plant is rare and in the valley there is its largest biotop. Rosy flowers of Bird's – eyed primrose (Primula farinosa) which rise between dark stems of Black bog – rush (Schoenus nigricans) give a special charm to the water springs in springtime. On the more humid grounds very common are also both carnivorous plants, a Whiteflowerred alpine butterwort (Pinguicula alpina) and a Blueflowerred common butterwort (Pinguicula vulgaris). The valley of the river Sava Dolinka is a home for several endangered animal species. Half of all known amphibian species in Slovenia can be found in the stagnant water systems near the bank. Nine butterfly species that occur here are rare in the alpine region. A Common sandpiper (Actitis hypoleucos) uses river sandbank as its breeding place. Nearby, in pine crowns, two raptor species are breeding, a Black kite (Milvus migrans) and a Hobby (Falco subbuteo). The area is one of two in Slovenia where breeding of the Black kites was confirmed. Under Piškotar's bridge is the most northwestern place where huchen (Hucho hucho), the greatest predator in fresh waters of Eurasia, are spawned. In waters of the Dolinka valley also an endangered lamprey can be found. A river with its banks is a very dynamic system, which changes continuously. It was mentioned in the old Franciscan cadastre that there was an island in B'rje area. Nowadays the river is still deepening its bed and sapping its banks. The dam of the HE Moste took away the river its gravel but not its power. This should be an experience to become aware that nature is our true value, and that natural habitats are so complex that they can not be replaced by man if destoyed. An information that was inscribed in every ecosystem by thousands of years of emerging, transforming and adjusting can not be falsificate even in a modern information era. So, let's preserve and take care of already recognised and many times verified values. If comes to a realisation, the project "Sanation and Enlargement of hydroelectric power plant HE Moste" with a compensation basin, is going to completely destroy a natural monument of wetland B'rje. Therefore the old hydroelectric power plant with its accumulation basin yet being in an operation for a half of a century, must be renewed. Works should be in accordance with the natural potential of this area, following a holistic concept which appreciates signage between the river and its environment as much as the condition for the maximum production of energy. By supporting this approach the communities of Bled, Jesenice, and Žirovnica will make a step forward in a new cycle of sustainable development which is going to last. The two valleys were created in Glacial. The glacier of Bohinj carried the huge amounts of a material at first, which ground and deepened the valley of the River Sava Bohinjka later on. The other glacier in the valley of Sava Dolinka was weaker, reaching only the slopes of Blejska Dobrava while the more extensive glacier of Bohinj pushed the river Sava Dolinka away, right to the very foot of the Karavanke mountains. During the warmer interglacial period, the river moved its course again toward the slopes of Mežakla. At the end of the last glaciation the river cut its gorge of Kavčke, which was flooded for the purpose of the hydroelectric power plant in 1951.